Pilates founded by Joseph Pilates in the 1920s, is a system of muscular skeletal exercises and is the culmination of years of human endeavour to perfect body development and physical training. These exercises show you how the body works in functional movement through isolating specific muscle groups, in particular the postural muscles. Both Pilates and Yoga share similar postures, Pilates however emphasizes the importance of utilizing the stabilising muscles of the body while in movement to create a very safe and strong form of exercise. Solomon Yogalates™ is an internationally acclaimed exercise system fusing the best of ancient yogic spiritual practice with the core stabilizing, functional, and regenerative of Pilates. Yoga dates back to around 3000BC. It aims to create union between body and mind to bring about overall wellbeing. It enhances strength, stamina, aerobic capacity, flexibility, balance and mental clarity. Yoga is a strong spiritual practice which has withstood the test of time. Yogalates was founded by Louise Solomon, who formulated this method after discovering the benefits gained from Pilates and rehabilitating and injury she sustained from a strong Yoga adjustment. Louise started integrating Pilates into the Yoga room and has continued to teach this method here in Australia and abroad ever since. Over the past 10 years her work has culminated in developing a government accredited course to train others to teach this method to the general public due to the high demand for this style all over the globe. Louise has also worked as a personal trainer and lectures on core stability at Southern Cross University. Yogalates is a complete and comprehensive fusion of Yoga and Pilates; it is an ever evolving method which stays abreast of the latest medical and scientific research into how the human body functions during movement integrating the theoretical into the practical. Establishing a foundation of knowledge within the mind and integrating it into the function of the body is the key to the Yogalates method. It is a movement system that stretches and strengthens all the major muscle groups developing a streamlined slenderness rather than bulk. During a session particular attention is paid to building strength and endurance in the body’s core postural muscles (the stablises). This promotes “core stability” which enhances spinal/pelvic awareness protecting the spine against injury whilst supporting the internal organs and promoting good posture. Resistance bands also used in Yogalates to replicate the resistance training of the Pilates machines, excellent for strengthening, lengthening and balancing the musculature of the body, helping to bring about balance in the whole being. Much more than a movement system, Yogalates places emphasis on the breath throughout a session. The Pilates thoracic (chest) breathing is incorporated to help increase lung capacity and enhance stamina and endurance. This breath activates the abdominal and pelvic floor muscles helping to protect and strengthen the lower back, tone the belly, trim the waist and assist core stability. 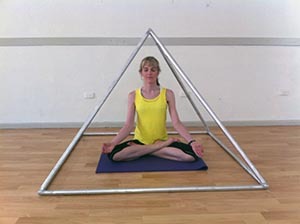 Different Pranayama, Yogic breathing techniques are also used, some to energise and invigorate others to calm and soothe the nervous system aiding relaxation and the release of stress and tension. Yogalates is a safe practice which promotes unity of the body and mind, freeing up energy to flow unhindered through your entire being. It is ideal for those needing to strengthen their backs, those suffering from arthritis or osteoporosis, and post natal women. It is excellent for developing general tone and fitness in the body while also creating a sense of inner calm, relaxation and overall wellbeing. At the end of each Yogalates session we finish traditionally by all repeating the Sanskrit word NAMASTE……..which is a greeting used in India and Nepal. It has many definitions the more common one “the divine in me recognises the divine in you”. Mutual respect is acknowledged between the teacher and the student.